Subject: FW: coordination of Japan event response between OpE Branch and NRO – plan on a 2:15 to 2:30 meeting every day. 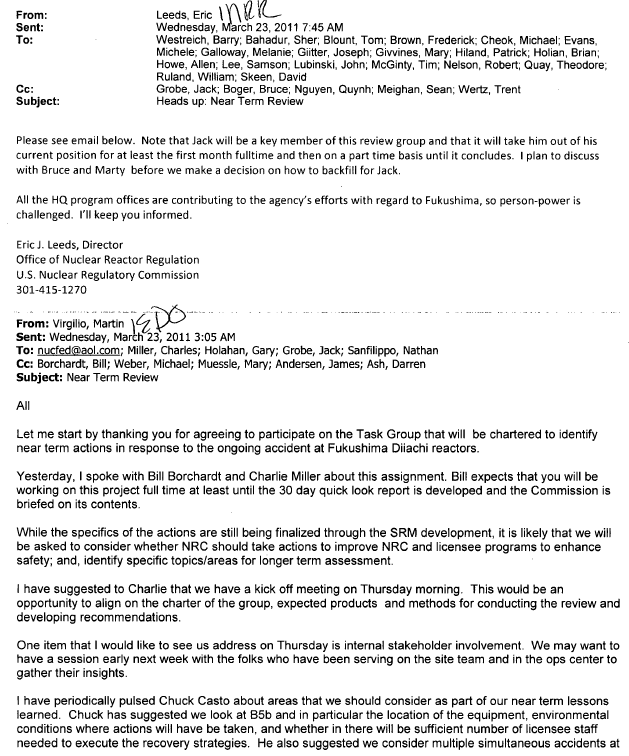 Dave,The real reason we are suppose to be having this meeting – the Information Notice that came out by NRR was not run by NRO until two hours before it was to be issued. They rightly felt pinched / cut out of the loop by the development/ review process having only two hours to review and sign it out late on a Friday. Not sure this meeting would have prevented that since IOEB / you were not involved in the IN development. I think we are looking for you to step up and be more involved with the Japan events / perhaps stop by the IRC once a day, maybe shortly before the 2:15 meeting to get the latest and greatest info / updates… and keep up with the on-going developments.., and maybe have more frequent updates of your OpE COMM(s) – as needed. Subject: RE: coordination of Japan event response between OpE Branch and NRO – plan on a 2:15 to 2:30 meeting every day. I’m not sure these meetings will answer the questions you identified Mark, but it makes sense to begin documenting all the OpE questions we do have so we can begin answering them as the information becomes available. I think the meeting is going to be a fairly short, “touch base” and compare notes meeting to discuss what we know and what if anything else needs to be done, especially as it can relate to updating and considering information for sharing with staff and for proposing as inputs to new/updated generic communications, perhaps even discuss how to best break down the event into more manageable IFR’s to address the significantly different aspects of the event, if that makes sense. Tim Frye and Stacey Rosenberg, I ask for your specific thoughts and expectations on agenda of the quick 10- 15 minute meeting at the end of each screening meeting. RE: Let me know what you think; is 2:156 a good time for folks to begin discussing the Japan response… short term 30-day quick look, middle term response 90 day response and long and very long term studies/investigation needs.